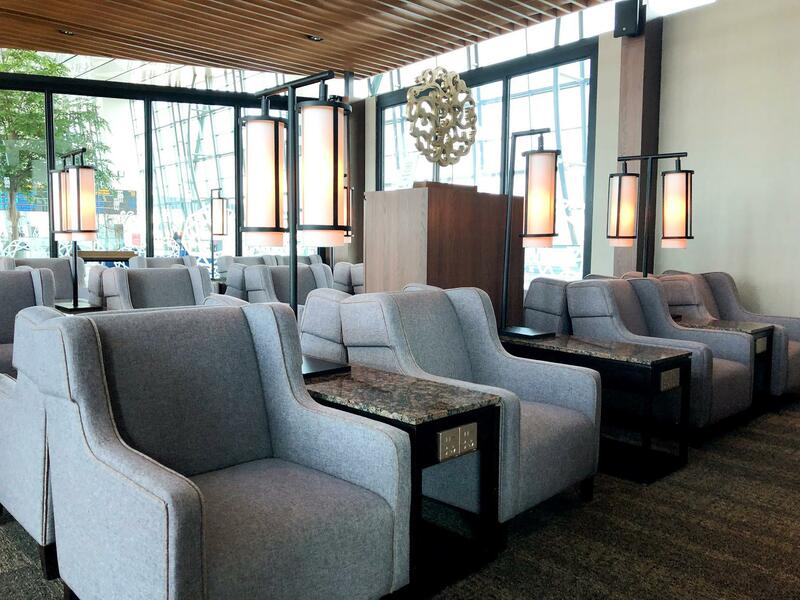 There is a lot to like about this lounge, but is it worth paying for access? 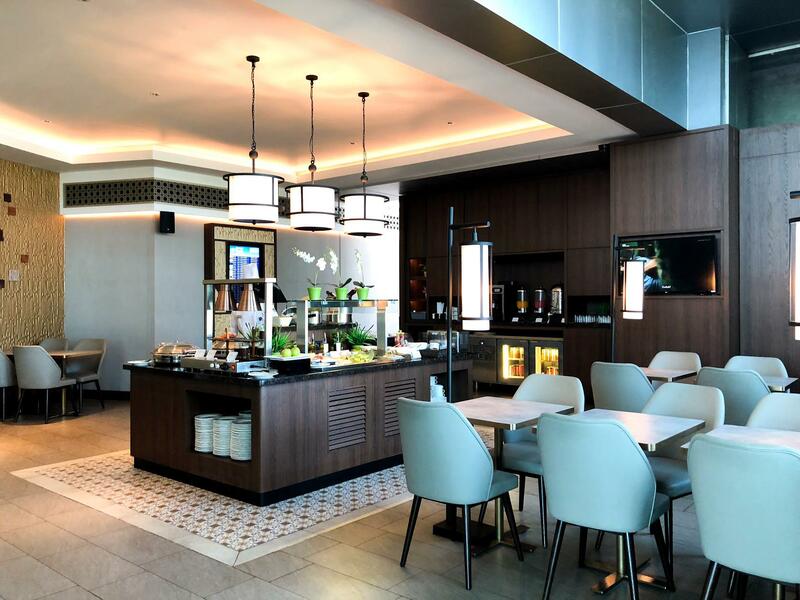 Amid the humid hallways and dated design of Jakarta Airport, the Plaza Premium Saphire Lounge is a shining gem of a lounge – open to those with selected lounge access memberships such as DragonPass, premium Qantas passengers on QF42 to Sydney and anyone willing to part with some cash. Please note that this lounge is not accessible with Priority Pass. You will find this lounge after security (Level 2) in the newest Terminal 3 of Jakarta Soekarno-Hatta International Airport. It is located on a corner of the terminal, in between Gates 4 and 5 (the entrance is closer to Gate 5). The space is shaped as an ‘L’ snaking around one of the corners of the terminal. As you enter the reception area, you will find yourself in the longer ‘arm’ of the lounge. Immediately to your right is a swath of seating – in your typical two-by-two arrangement. A line of chairs also lines the windows, offering great tarmac views. Heading back to the left, you will come across a staffed Noodle Bar offering freshly made dishes. 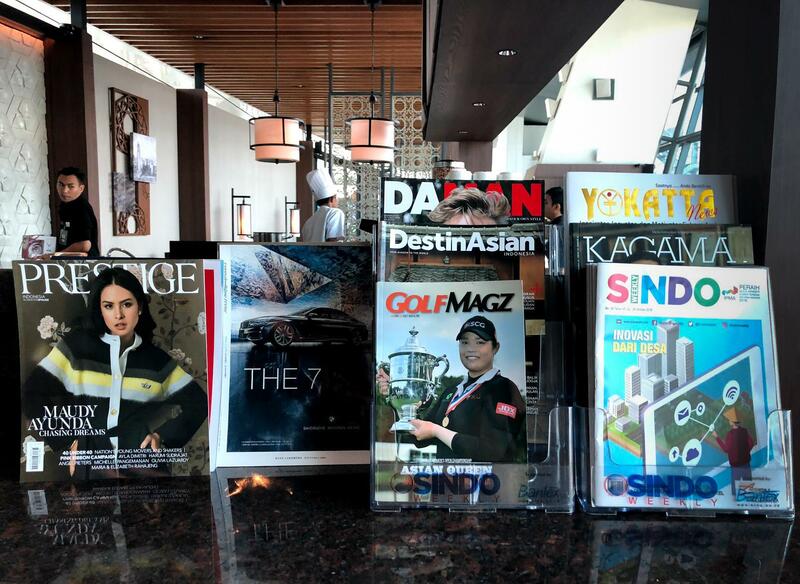 The only magazines in the lounge are displayed here as well. 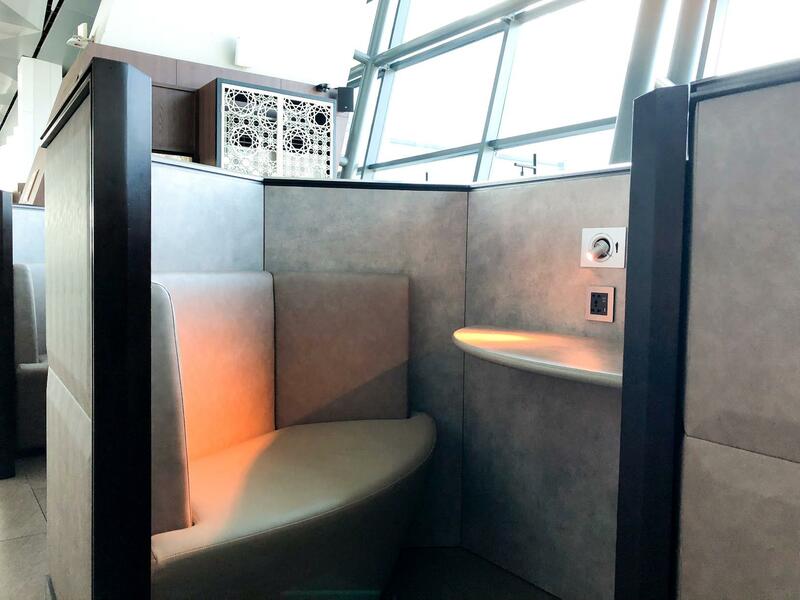 Adjacent to the counter is a group of interesting interlinked hexagonal work pods, perfect for individuals to settle down with a drink and get working. It is best visualised from this official photo, taken from above. Here is the view from inside one of these pods – there is a work light and a charging port. Some shared high tables fill up the rest of this ‘arm’ of the lounge. After a sharp 90 degree turn to the right, we now enter the second, smaller ‘arm’ of the lounge. The main food and beverage stations are here, along with dining tables. Moving past here, you will find the final seating area comprising of the usual plush armchairs. 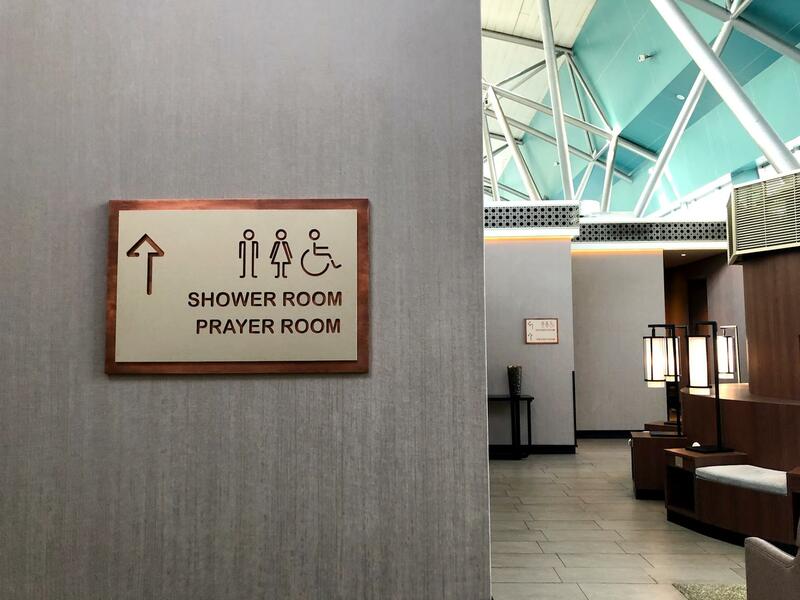 Right at the end of this section are the bathrooms and prayer rooms. The Noodle Bar near the reception offers three dishes – one Italian, and the rest Asian. 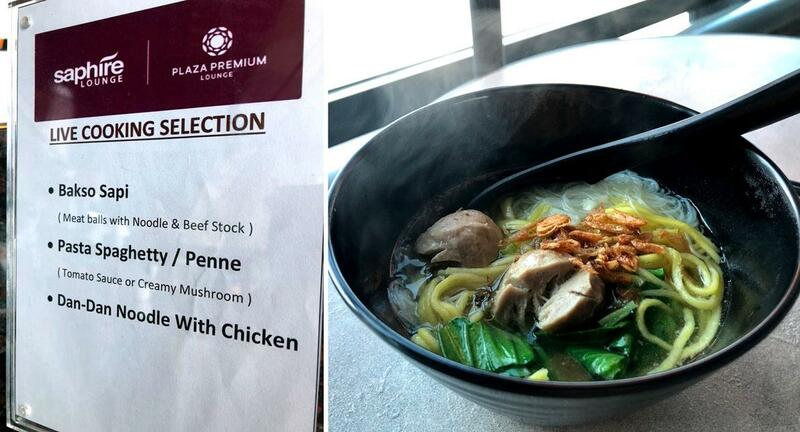 I tried the local dish beef bakso, which was light, fragrant and very enjoyable. Of course, no noodle station is complete without a dizzying array of spices and seasoning. 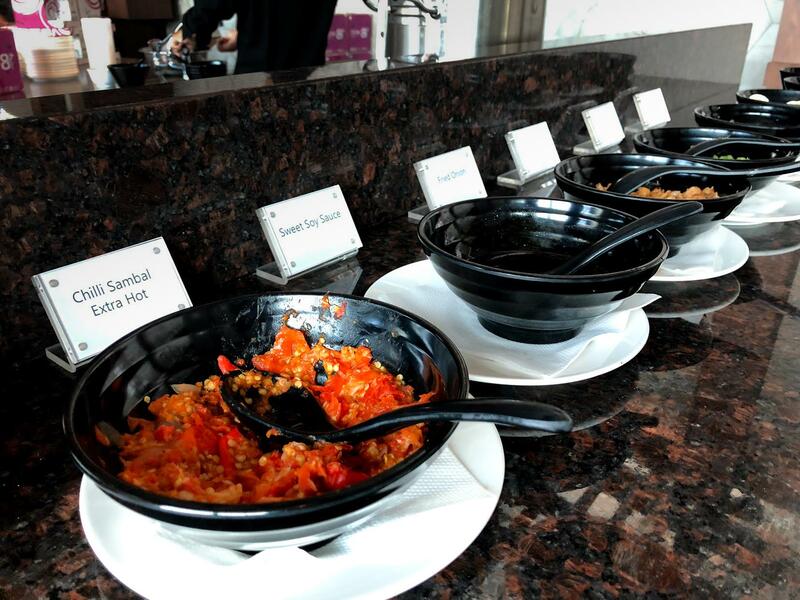 The main buffet station had four hot dishes on offer during our late afternoon visit, with an even split between Asian and European. Everything was of reasonable quality, but no standouts. 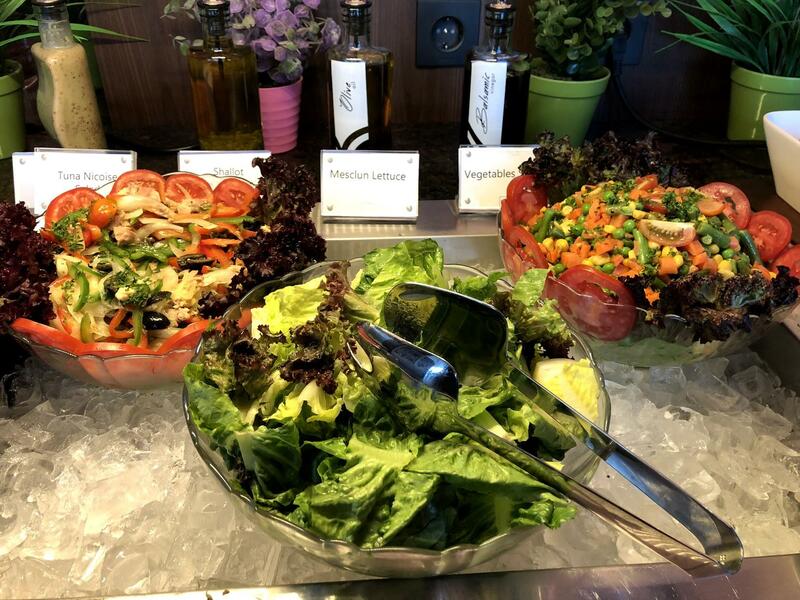 The cold station has some chilled salads with dressings, and cut fruits. There are also a few desserts to round off your meal. There is not much going on drinks-wise. A self-serve fridge has the usual assortment of soft drinks. 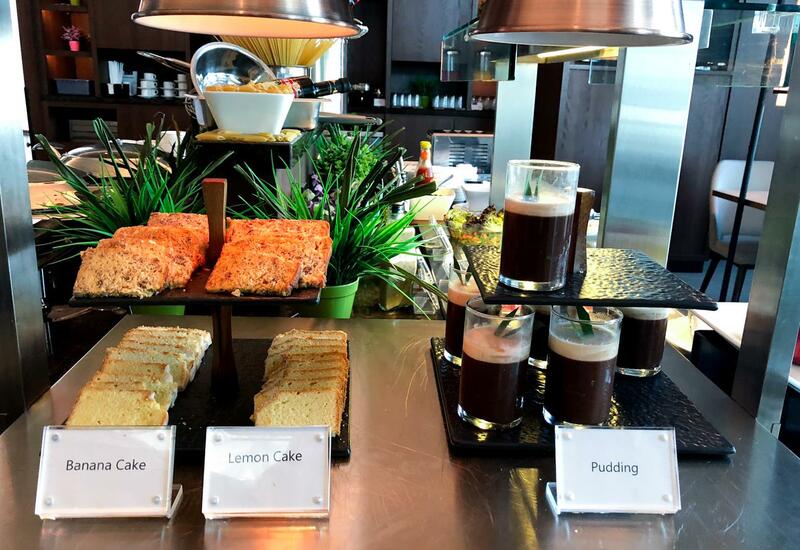 There is also a small counter near the buffet that will fix you up with coffee, tea or a glass of wine if you desire. There does not appear to be any beer or spirits. WiFi is blazing fast in this lounge, reaching almost 56 Mbps in downloads and 117 Mbps in upload speeds – that is not a typo. There are power points scattered throughout the lounge. 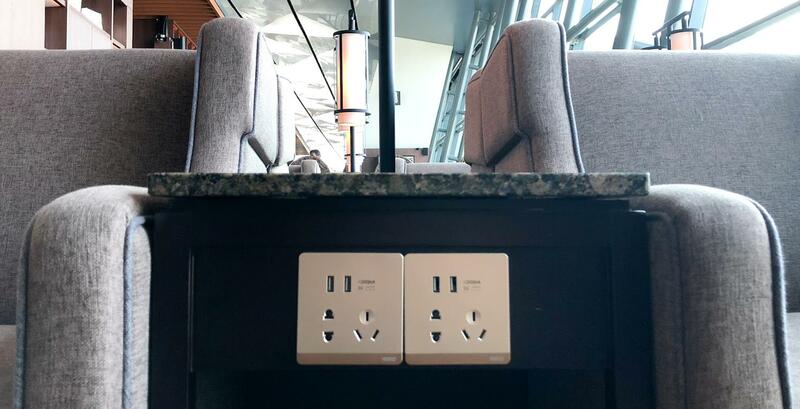 Although they do not have universal plugs, they do have USB, US-style and Australia-style sockets, so no adaptor is needed for the majority of Aussie travellers. 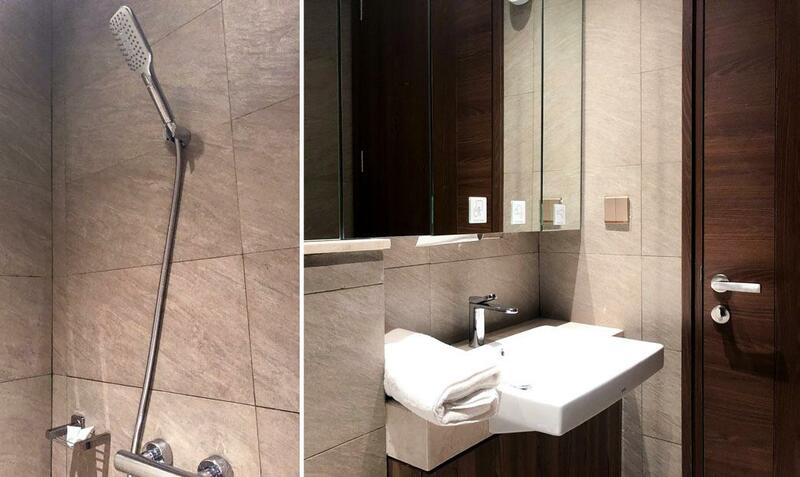 There are three individual suites which are cleaned in between each use. Towels are already in place when you enter. 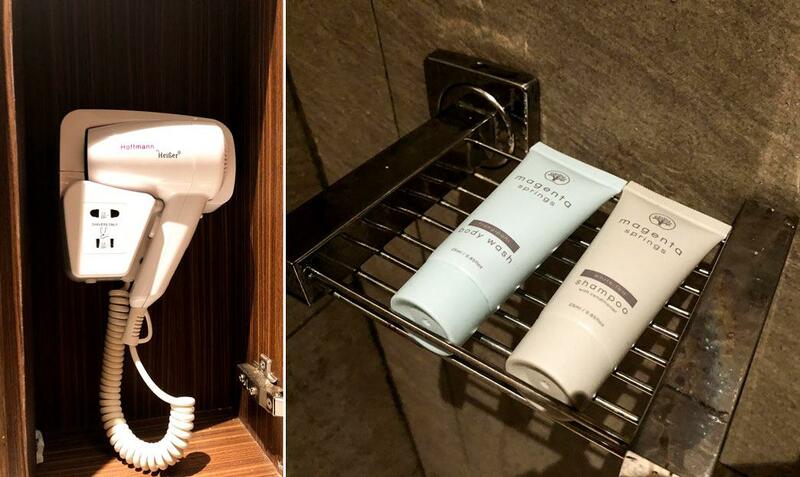 Assorted toiletries including mini packs of shampoo and body wash are supplied. 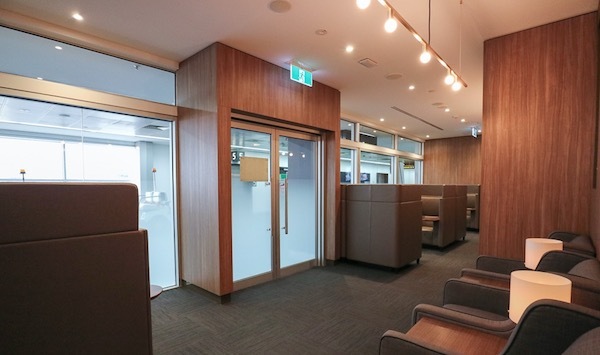 Qantas contracts this lounge for use by its premium passengers before flights to Australia (currently QF42 from Jakarta to Sydney). 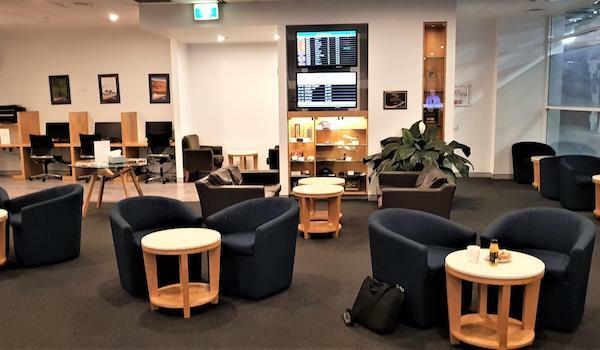 Qantas shares this lounge with other airlines. 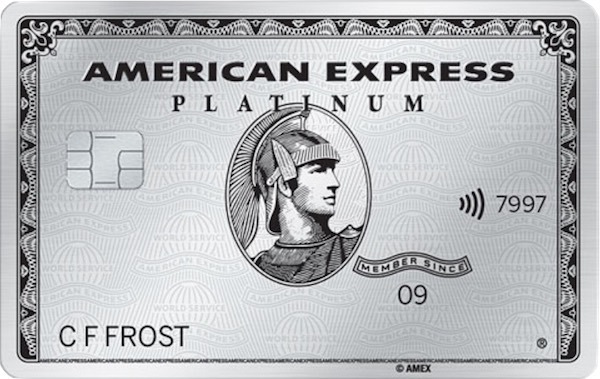 By credit card: American Express Platinum Charge, primary and supplementary cardholders – 1 guest and children under 3 years are admitted free. 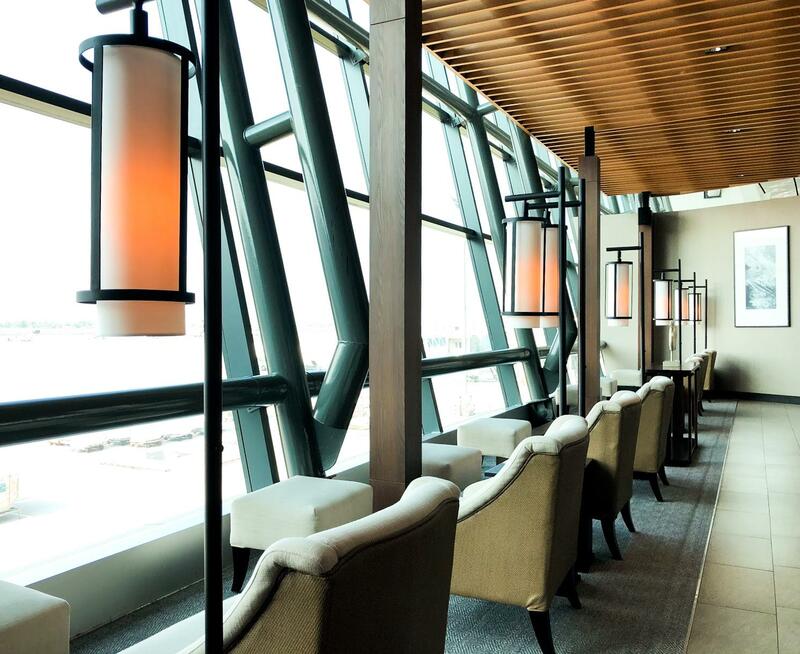 By lounge membership program: Access through Dragonpass and other selected lounge membership programs. By day pass: Plaza Premium sells access for USD 37/57 (AUD $52/$79) for 2 hours or 5 hours access respectively, when booked online. 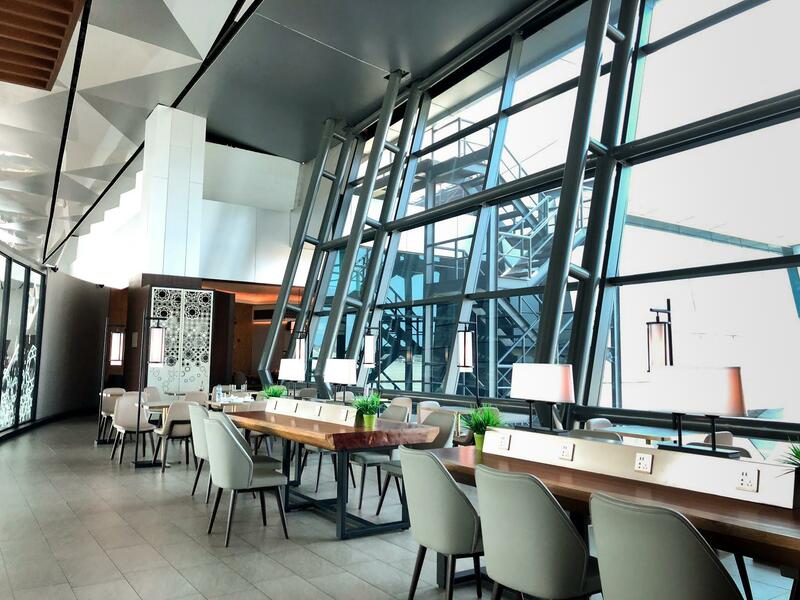 There is no walk-in access allowed – you must pre-book, have lounge membership, or be an Amex Platinum cardholder. 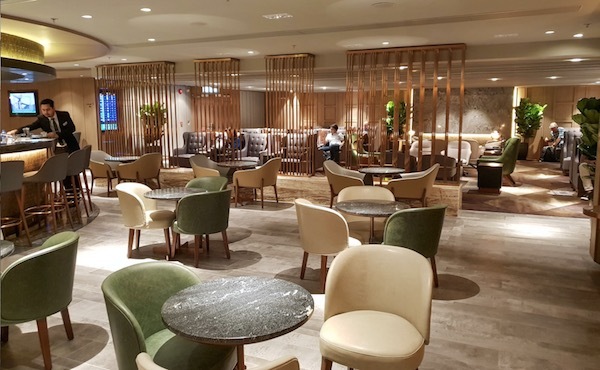 Having taken a quick glance at other contract lounges in Jakarta airport, it seems the Plaza Premium Saphire lounge is a standout, having been based on Plaza Premium’s modern signature design and furniture. 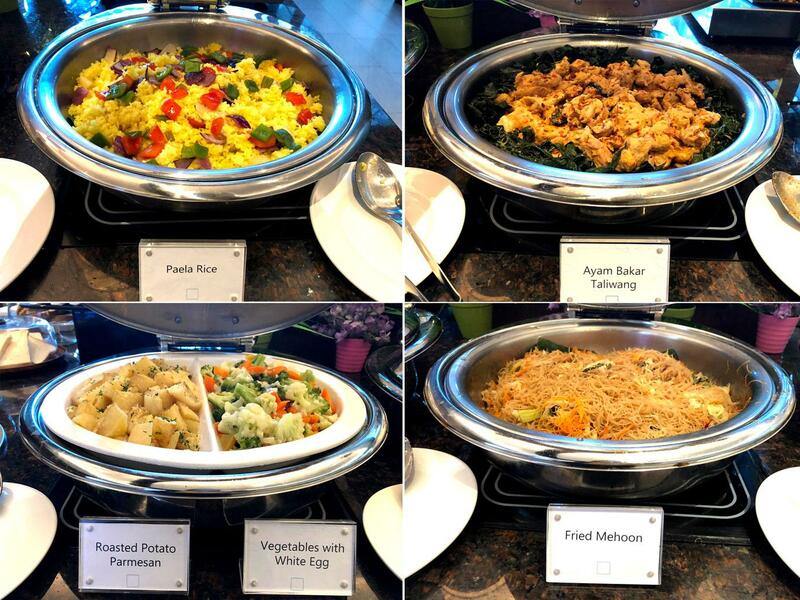 I particularly enjoyed the Noodle Bar’s excellent made-to-order dishes, while the hot buffet has more standard fare. 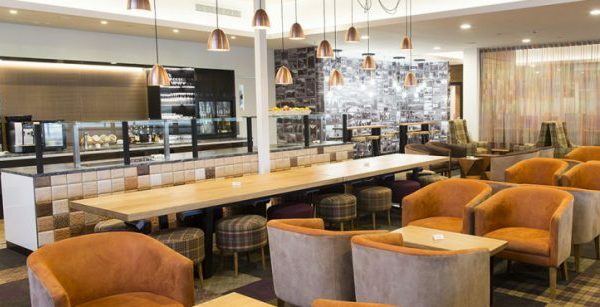 The hexagonal pods and the fast WiFi make it an excellent place to work from, and there is plenty of natural light and views to make the lounge feel airy. The shower facilities offer a much-needed respite from the constant heat around Indonesia. 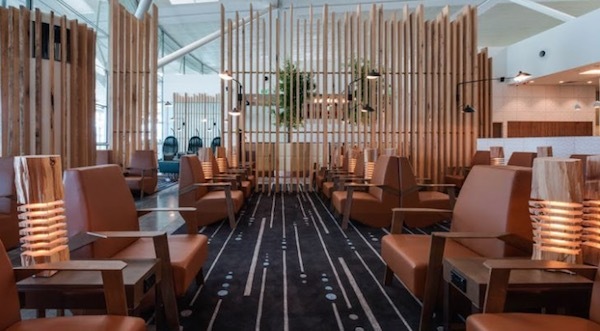 Unfortunately, the airport terminal is not very well air-conditioned, and while this is not the fault of Plaza Premium given their lounge is open-air to the main terminal ventilation, it does somewhat detract from the experience. The beverage options are limited – more chilled drinks (both alcoholic and non-alcoholic) would definitely be appreciated. 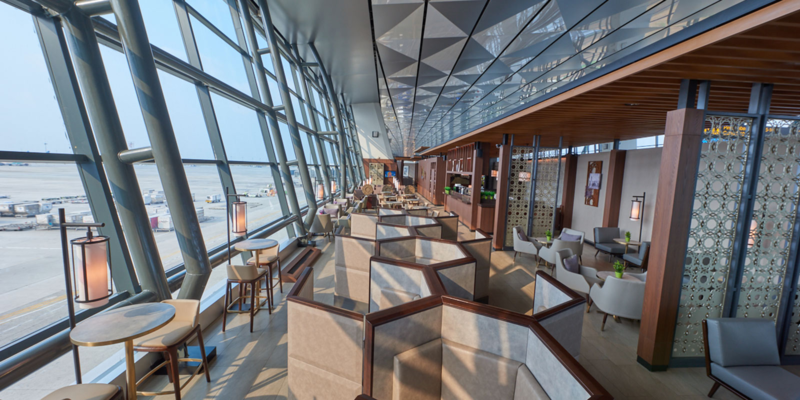 Overall, this is a fairly decent lounge for passengers if it is included in your ticket or lounge membership, but I would be hesitant to recommend paying for access. You can request beer at the counter that serves the wine and other beverages. Enjoying a Heineken as I type. Hello Evin, this lounge is not accessible for Priority Pass. 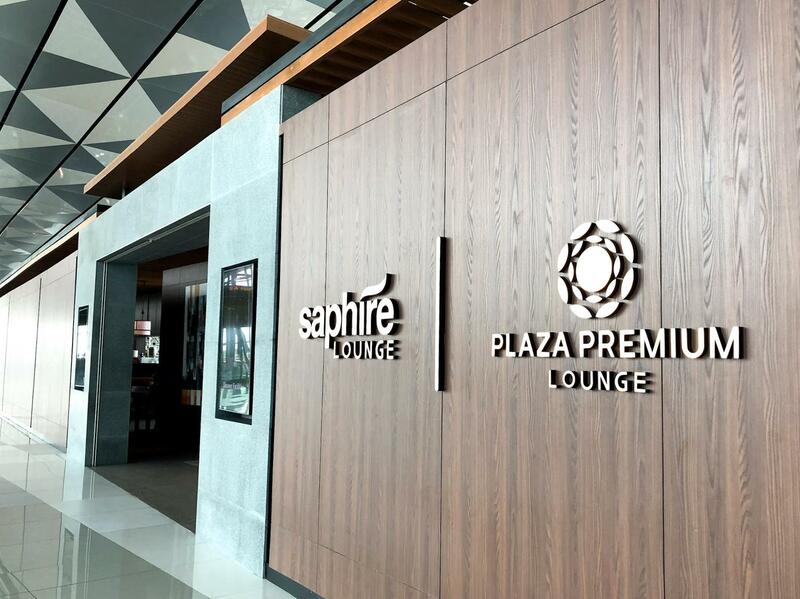 You maybe confusing this Plaza Premium Saphire Lounge with the Saphire Lounge (opposite gate 7 and 8 ) which grants entry for Priority Pass. 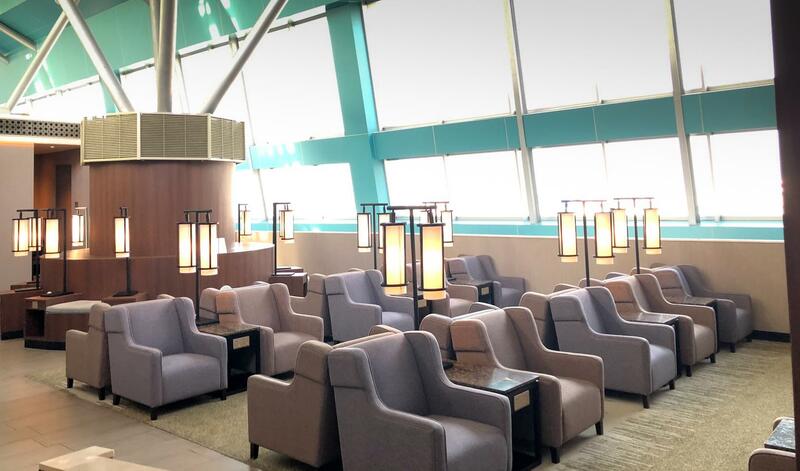 They are different lounges. The Plaza Premium Saphire Lounge is accessible for Dragon Pass. Thanks for letting us know! 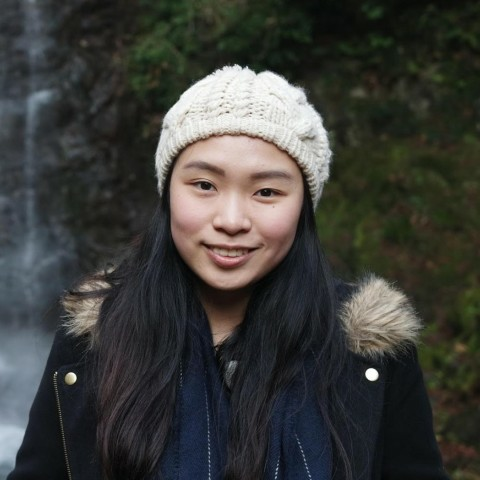 The article has now been updated.